Attack of the Giant Bow! ← You Want Me To Wear What? Many retailers are jumping on Christmas early this year, in hopes of encouraging sales. Forever 21′s take on this seems to involve really, really giant bows. You know what this dress doesn’t need? That random black trim along the neck. Having just the bow could work and look like a nice little J. Crew knockoff. But having the added black bric-a-brac just makes it look like they had some extra felt lying around the F21 factory and got a little too creative. And creativity, at Forever 21, is rarely a good thing. Then again, a total lack of creativity is a problem, too. Case in point: this giant t-shirt that they threw a big bow on. A really big bow. The kind of bow they put on pots of poinsettia at the grocery store. Which, again, in keeping with the Christmas idea, so I guess it kind of makes sense. But just because something makes a little bit of sense doesn’t mean it’s actually, y’know, worthwhile. 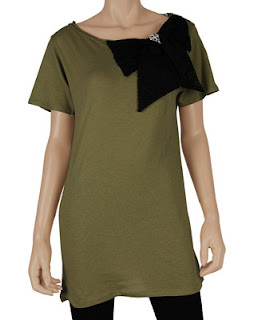 This t-shirt dress thing, I would argue, is not particularly worthwhile. Apparently, this is a sweaterdress. I was so distracted by all the ruffles and the giant bow, I didn’t really pay attention to the material. So yeah, let’s just take their word on it. There is so much going on here. 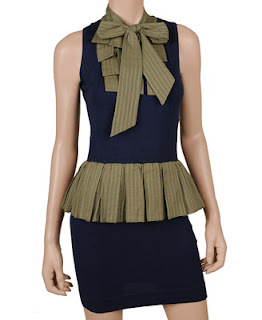 A giant bow, rippled bow material running along either side of it, and it has a peplum. A PEPLUM, people. That just seems excessive. Is there any way in which this dress could be less flattering? Oh, yes. It comes in my least favorite color ever, pink skin tone. This is not a flattering color on many people. And, if you’re pale, it makes you look like you’re naked. I’m sorry, it’s the truth. Many times, I’ve had to do a double take to make sure someone is, in fact, clothed and just wearing this useless color. Wear this dress at your own risk, especially in Flesh Pink. There’s a chance that it will look like you’re wearing a a bow, a peplum, and little else. Although, if that’s the look you want, go for it.